Today I’ll be indulging in some Hollywoodness and talking about a movie. There will be three parts. Part 1: My Background with the film. Part 2: My Synopsis of the film, and Part 3: My Grand Philosophical Conclusions from the film. This is Part 2. 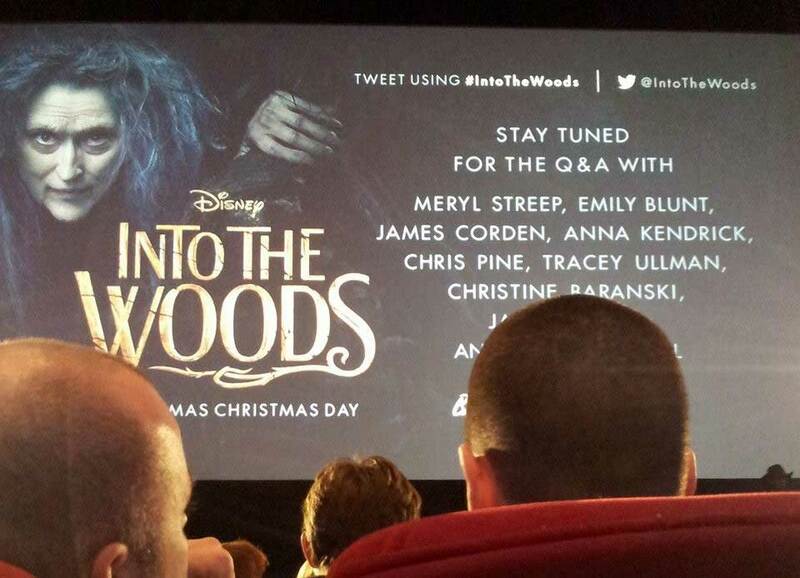 First and foremost, though Into the Woods is rated PG – it is NOT A KIDS MOVIE. There is no/little swearing and the action is more adventurous and dark than violent, which is why it has a PG rating. But, I can’t imagine any kid under 8 even being remotely interested in it. This is not your typical fairy tale story; it is a exploration of many deep themes, using the context of fairy tales woven together. A child who cannot yet pick up on these themes is likely to get bored quickly. I personally do not suggest taking a young child to see this film. They will not understand it. Though pre-teens and early teens might enjoy the story on the surface, I doubt they’d comprehend the complexity. 16+ will probably begin to sense a philosophical undertone, but in my opinion – this story is best experienced and understood as adults, like mid-20s and older adults. This picture will have to do again for Part 2. After watching the film with the “new eyes” of 11 years worth of life experiences and philosophical evaluations, here is my take. The story begins with several characters singing about what they wish for more than anything and would be willing to do anything for. The central storyline is that of a baker and his wife who desire to have a child. After learning that a witch has placed a curse on their household and that they will remain barren unless they fulfill the witch’s requests, they enter into the nearby woods to try to locate the items the witch has demanded. Once in the woods, many things happen. Several fairy tale characters meet, interact, and influence each others’ storylines.The baker and his wife trick a boy named Jack into trading beans for his cow. A girl, wearing a red cloak and bringing bread to her grandmother, gets distracted by a wolf, who then eats her and her grandmother. The baker arrives just in time to cut open the wolf and save the girl and her grandmother. The baker’s wife helps a servant girl who is running away from a prince’s festival and later acquires her golden shoe; she also cuts off and steals a braid of yellow hair from a girl locked in a tower. Not only are the woods the backdrop for all these interchanges, but the woods also seem to have a strange influence on the impulsive and adventurous behaviors of the characters. Everyone enters into the woods seeking the achievement of their deepest wishes, and through unexpected and interwoven events, eventually leaves with what they desired. Or so they thought. And there ends Act 1. In the Q&A afterward, the producer mentioned that high school performances of the musical often end it after Act 1. With the Happily Ever After intact. Sure, there were difficult parts on the journey through the woods, but it all turned out ok for the characters after all. The ends justified the means and now everyone lives happily ever after. Everything is great. At first. The baker and his wife have a baby boy. Jack and his mother are now rich. Cinderella is married to Prince Charming. Rapunzel has been rescued from the tower by her prince (who is apparently Prince Charming’s brother). Little Red Riding Hood went safely back home to her mother. But their happiness is short-lived. A revengeful giant climbs down a beanstalk and destroys the village. In order to save the kingdom, all our characters once again enter into into the woods in order to find and stop the giant. But this time, what was once the allure and freedom of the woods has turned darker. The stress of parenthood causes a rift between baker and his wife. Prince Charming is unfaithful. The baker’s wife is seduced by another man. Little Red Riding Hood is separated from her home. Jack’s mother’s new-found wealth does not save her. The life that our characters wished for ends up not being as wonderful as they thought it would be. Some more things happen (I don’t want to give away too much), and along the way our characters are faced with difficult choices that don’t have easy answers. Yes, eventually the giant is stopped, but it is at the expense of the woods, their homes, and some of their loved ones’ lives. In the end, all they are left with is to pick up the pieces and start life anew. I suppose it’s a bit depressing of an ending, but the remaining characters depart what’s left of the woods with the hard lesson learned that what you wish for is not always what you really want. And that’s that. The tagline, moral, and nice packaged, patted ending. But I couldn’t help but leave the theater feeling like there was a lot more to this story than meets the eye. In the Q&A afterwards, the actors/producers made several mentions that there are many themes in the film and that some of the themes are about loss, parent/child relationships, etc. None of them touched on the vague profoundness that I picked up on. I don’t know if this was done purposely to make the story seem easier-to-digest and therefore appeal to a wider audience, of if I perhaps was just digging far too deep. But the more and more I thought about it, the more I knew that there was a deeper story in it all that I doubt was completely unintentional. Upon thought, I feel confident stating that Into the Woods is a much more beautiful and complexly interwoven morality tale, with deeper, darker, and philosophical undertones, than initially appears on the surface. It’s driving me crazy, and it’s a small note, but this was not a play, it was a MUSICAL by STEPHEN SONDHEIM – a legend. Oh, oops, sorry about that and thanks for letting me know. I’ll go and edit any mention of ‘play’ and change to ‘musical’. 🙂 As someone who did not grow up well-exposed to the world of the stage, I had assumed that the term musical was a subset of the term play. I did not realize that they were exclusive terms. Thanks again for the heads up though!